There's a little something for everyone this week, and there's no better place to begin than at the beginning, so let's go through the week a day at a time! Saturday night football! 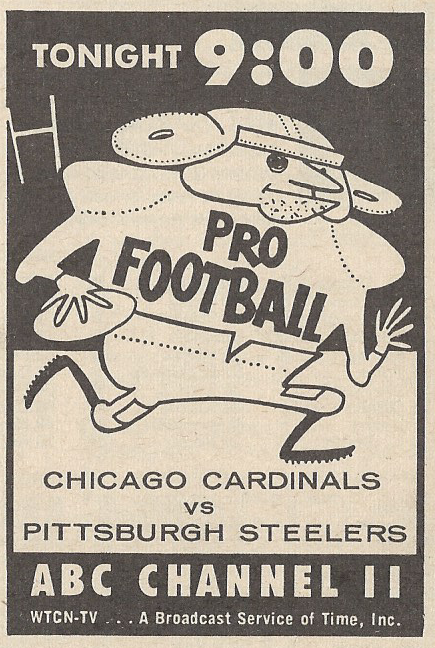 The NFL preseason continues with a game between the Pittsburgh Steelers and Chicago Cardinals from Austin, Texas. The appeal of this game would have been obvious: Bobby Layne, the star quarterback of the Steelers, was a native of Texas and an all-time great at the University of Texas – which, of course, is in Austin; while John David Crow, star halfback of the Cardinals, had won the Heisman Trophy at Texas A&M. In these days before widespread coverage of pro football, when Texas didn’t have any professional football of its own, I imagine the chance to see two of Texas’ greatest football stars live and in person made for quite an event in Austin. 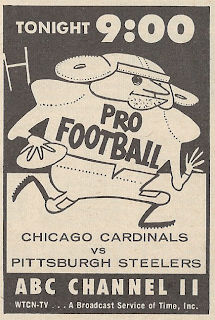 The Chicago Cardinals were nearing the end of their run as the number two team in the Second City. Their history in Chicago dated back to 1920, but those years were spent mostly in futility and by 1959 the team had had only one winning season in the decade. There was no way the Cards could compete any longer with the Bears, and as the Bidwell family (which had owned the team since 1932) looked for options, a number of businessmen sought to buy the team and relocate it. Those attempts failed due to the family’s insistence on maintaining majority ownership of the team, and eventually the NFL allowed them to move the team to St. Louis. Among those businessmen seeking (separately) to buy the Cardinals were Lamar Hunt and Bud Adams. When those efforts failed, they joined forces with others to form the American Football League, Hunt owning the Dallas Texans (which eventually moved to Kansas City) and Adams the Houston Oilers. I can’t help but wonder if the scheduling of this game was perhaps a trial run to test out the Texas market. In any event, by the next year the Lone Star State would have three professional teams: the Texans, the Oilers and the Dallas Cowboys. Of the three, only the Cowboys remain where they started. On Sunday afternoon at 4:30, Arkansas Senator J. William Fullbright* (listed in TV Guide as “James W.”, which is technically correct but not the way he was usually referred to) is the guest on CBS’ Face the Nation. I’ve frequently mentioned how sports was not always wall-to-wall on the weekends, and stations generally filled the time with public affairs and documentary programming. At various times this Sunday we have Open Hearings (hosted by ABC’s John Secondari), College News Conference, Victory at Sea, Conquest (a science program on CBS narrated by Eric Sevareid), NBC’s Meet the Press (with this week’s guest, Erwin D. Canham, president of the U.S. Chamber of Commerce and editor of the Christian Science Monitor), The Twentieth Century (CBS), and Chet Huntley Reporting (NBC). Religious programming, such as This Is the Life, This Is the Answer and The Gospel in Art fill out the schedule, along with Quiz a Catholic, which I guess would be both religion and public affairs. *Fun fact: Fulbright’s sister Roberta is the maternal grandmother of Fox pundit Tucker Carlson. There is some sports on Sunday; both NBC and CBS have afternoon baseball (Red Sox vs. Indians on CBS, Orioles vs. Tigers on NBC)*, but the games are blacked out in the Twin Cities, as the Triple-A Minneapolis Millers are hosting the Kentucky Colonels. WCCO fills the time with more auto racing from Shakopee’s Raceway Park. *CBS broadcasts from Cleveland both Saturday and Sunday, as does NBC in Detroit. There was no collective television contract for either Major League Baseball or the individual leagues, which meant networks were free to sign up whatever teams they could. The blackout rule of the time protected minor league teams from suffering attendance drops because of televised major league games.. The American Legion is having their national convention in Minneapolis, and on Monday both Channels 4 and 9 offer coverage of the Legion’s parade, which is expected to last eight-to-ten hours, with 7500 marchers, floats and bands, and delegations from nine foreign countries. 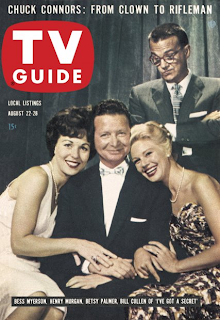 Channel 4, the CBS affiliate, breaks away from the coverage from time to time for local news, soaps, and game shows; Channel 9, the independent station, actually begins its broadcast day 2 ½ hours earlier than usual, and only breaks for an afternoon movie. A few years ago, while I was still living in Minneapolis, the Legion returned to the city for its convention, and I can testify that the parade is very long and very colorful, though I don’t think it attracted the crowd it did in 1959. One thing I really like about the listing for this is the reference to representatives from “the 49 states.” That’s right, we’re in that one-year period when Alaska’s achieved statehood, but not yet Hawaii. That we’re able to capture a reference like this in writing, from such a relatively short timeframe, is just a very cool cultural reference. 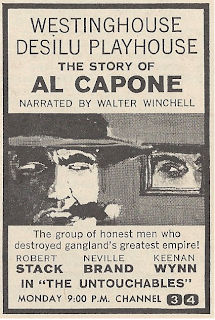 *Fun fact: Desi Arnez, whose Desilu studio produced The Untouchables, went to high school with Al Capone’s son. Tuesday features a David Brinkley report entitled “Back to School,” which takes advantage of the upcoming start of the school year to examine the problems faced by America’s public schools. Not surprisingly, they’re some of the same problems that exist today, particularly financial ones: crowded classrooms in New York, no money for school construction in New Orleans, no funds for facility maintenance in Los Angeles, and desegregation problems throughout the South. But if you look closely, you’ll notice something strange. Many of those challenges facing American school systems in 1959 are the result of overcrowding. New Orleans, Los Angeles, Oklahoma City, New York – all face a need for more school buildings to house additional students. The school I attended for grades K-6, built early in the 20th century, had temporary classrooms built to accommodate the growing student population. And that’s not happening today. The baby boom is over, and in many places the increase in student enrollment comes from immigration, from people moving to a community from another state or country. Some school systems may be looking at expansion, but in how many situations is this anything other than a zero-sum game, with enrollment increases in one area coming at the expense of another? Wednesday: One of the more unique programs on television is Court of Last Resort, based on Erle Stanley Gardner’s organization, devoted to investigating cases in which reasonable doubt about the original verdict exists. Gardner, the creator of Perry Mason, started the actual Court of Last Resort in 1948, and the program’s 26 episodes are based on actual cases investigated by the real Court. The show ran for a single season in 1957-58 on NBC, and the broadcast in this week’s TV Guide is part of the series’ rebroadcast on ABC in 1958-59. Actors played the principles, but the real members of the Court appeared at the end of each episode. The real-life Court investigated the murder case of Dr. Sam Sheppard in the late 50s, with Gardner believing in Sheppard’s innocence even though nothing came of the Court’s investigation. Had The Fugitive existed in the same universe with Court of Last Resort, I suspect they would have investigated Dr. Kimble’s case as well. And isn’t that a meta conversation: a TV show, about a TV show about an organization started by the creator of a fictional character, investigating a character from another TV show. Makes your head spin, doesn’t it? Thursday: Now here’s the type of local programming you don’t see anymore: at 7:30 on Channel 4, Operation Southdale presents a fashion show in the Garden Court of the famed Southdale Center in Edina, Minnesota – the nation's first enclosed shopping center. “For the men’s benefit,” an auto show is being held in the parking lot. And a musical group called the Jimarlen Trio provides background color for the show. For this, Channel 4 pre-empts a rerun of Yancy Derringer. Later on Channel 4 (and the other CBS affiliates), Playhouse 90 presents a curious drama, based on the true story of the first hydrogen bomb test. In “Nightmare at Ground Zero,” starring Barry Sullivan, the scientists behind the development of the bomb discover that they’ve made a few miscalculations, and that the bomb is really many times more destructive than they’d anticipated. On the face of it, this sounds like all the makings of one of those 50s sci-fi movies that wound up on MST3K. You know how it goes – the bomb goes off, much more powerful than they’d thought, with the result that people or insects or vegetation (or all three) are turned into mutants 50 feet tall. And it was written by Rod Serling. But it’s also directed by Franklin Schaffner, who would eventually win an Oscar for Patton*, and the true story of the blast, which went off at 15 megatons rather than the expected five and vaporized three coral islands, in the process raining the fallout over a 7,000 square foot area , is remarkable. *Although Schaffner also directed Planet of the Apes, with a screenplay by Serling, so who knows? A big matchup for NBC’s Friday night fight on Gillette Cavalcade of Sports, as Gene Fullmer faces Carmen Basillo for the world middleweight championship from the Cow Palace in San Francisco. I’ve written before about how boxing used to be a major sport on television, and Friday’s bout is one of two broadcast in prime-time this week (the other being ABC’s Wednesday Night Fights). But there’s one thing that never changes in boxing, and that’s politics. The reason Fullmer and Basillo are meeting for the title is because the National Boxing Association (which would have been the bigger “NBA” at the time), had stripped Sugar Ray Robinson of the title, leaving the top two contenders, each of whom had both won and lost title fights to Robinson in the past, to settle the score. Fullmer wins on a 14th round TKO. 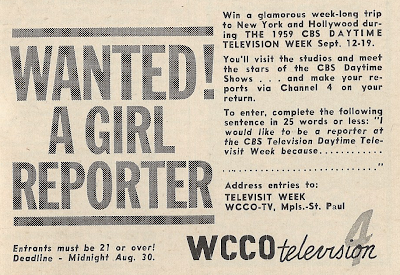 Finally, on Monday night there’s this ad from Channel 4 for a “Girl Reporter.” A few weeks ago I referenced Barbara Walters’ role as the Today show’s “Today Girl,” so the term wasn’t terribly unusual; still, it’s another of those things that reminds the reader that they’re in a different place and time. 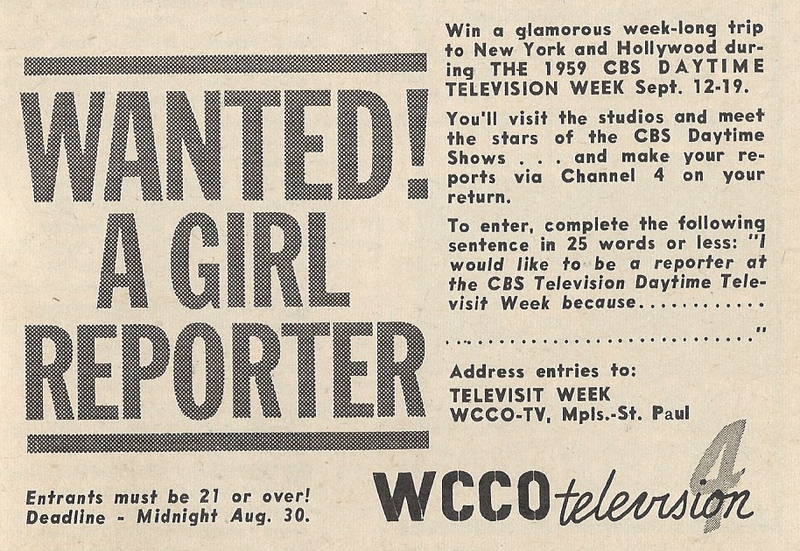 Naturally, the Girl Reporter’s job is to cover the unveiling of CBS’ daytime television schedule. I wonder who the winner was, and if she ever went into the media business? I brought my copy to work today, along with a few others from either end of the cover dates. - On Saturday morning, Channel 7 , the ABC ststion here in Chicago, ran a two-hour Saturday Show, MC'd by Chuck Bill, with a B-western and a cliffhanger episode. This was the latest revision of a long-standing cliffhanger show ch7 had been running for years, first daily, then a five-hour marathon on Saturdays (they would get a whole 12-chapter serial in in one day), then this format. Later on Saturday afternoon, Channel 2, the CBS station, had a live wrestling show, staged at their big studio on McClurg Court, just off Michigan Ave. They played it more-or-less seriously, and there weren't elaborate costumes or characters, but it could get pretty wild. - You mention Court Of Last Resort on ABC wednesday night. 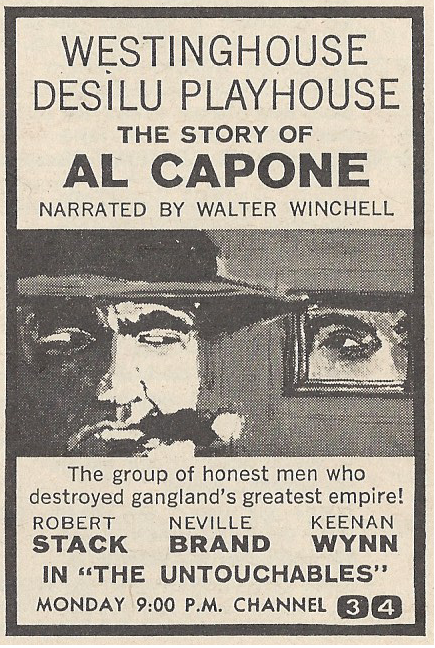 That same network had another series the same night, Accused!, which was a nighttime version of their daytime show Day In Court - "actual trials and hearings, simulated dramatically for television, illustrating the workings of justice." The main difference between the day and night shows was that the night show occasionally got name guest stars to appear as guests. It wasn't this particular week, but one such guest who did appear was the then-young Angela Lansbury; there were a few others I'll have to look up. The presiding judge on both Day and Accused! was a UCLA law professor named Edgar Allan Jones, Jr., who was allowed to make his own decisions during the live-on-tape show. I happened to recall all this because Professor Jones passed away just a few weeks ago, in his 90s. Frankly, there's just too much in here, and I was dumb enough to wait until the end of the day to write this. Hope so, Mike. Always enjoy reading through your reminiscences - they add a great deal to my own enjoyment of the issues! You never see the "tell why you want such-and-such in 25 words or less" contest format anymore, but I can recall seeing it into the early 70s. Imagine the poor schmucks who had to read all of the entries--which could have been hundreds and hundreds depending on what was being given away--and whether it was actually possible for the entries to be judged objectively. I wonder how many times the poor schmucks gave up, and the winner was simply decided by a random drawing.